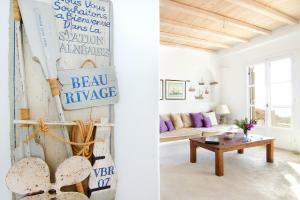 Featuring rustic yet contemporary design, Villa Amarillo is set in Houlakia. 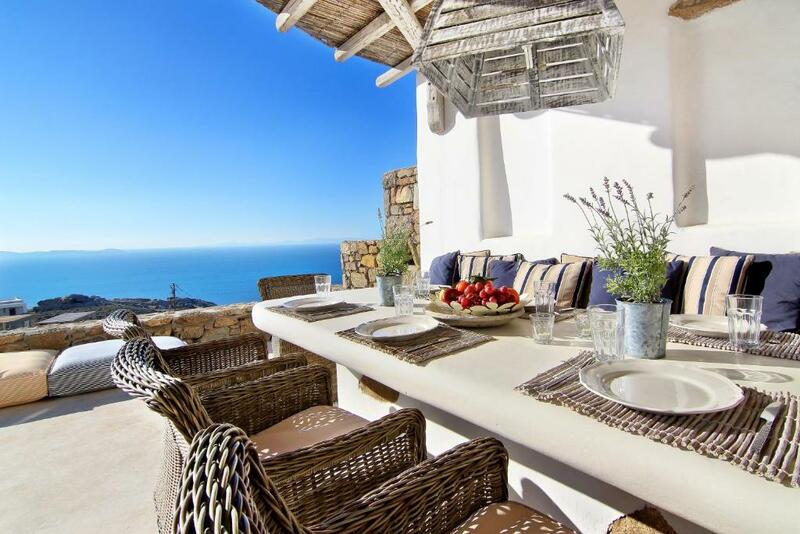 It offers direct access to a veranda with magnificent sea views. A shared swimming pool, sunbeds and shaded dining space are found in the villa’s exterior. This 3-bedroom stone, - built villa is split over two levels and is designed with respect to Mykonian style. The ground level consists of a living room with a dining table and an open-plan fully equipped kitchen, as well as a spacious bedroom with private bathroom. The upper level functions offers a master bedroom with an private bathroom and direct access to its own veranda and another bedroom with twin beds and private bathroom. Agios Stefanos beach with its crystal clear waters, cafes and restaurants is a short drive away. Mykonos Town and the old port is approximately 3.7 mi, while Mykonos new port is about 1.9 mi away. Mykonos Airport is 3.7 mi from the property. When would you like to stay at Villa Amarillo by Mykonos Pearls? 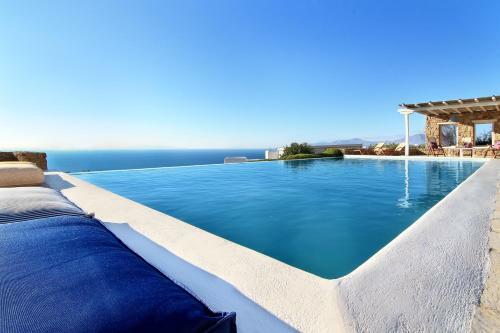 This villa features air conditioning, sea view and microwave. Villa Amarillo is located in Choulakia area, only at a short distance to the sandy, family-friendly Agios Stefanos beach. The villa expands on 2 separate levels, occupying a total area of 150 m². On the entrance floor there is a living room with dining table, an open-plan fully equipped kitchen, along with a double-bed room and an adjusted bathroom. On the upper level, there is a master bedroom with en-suite bathroom and direct access to its own veranda along with one twin-bedroom with its own bathroom. 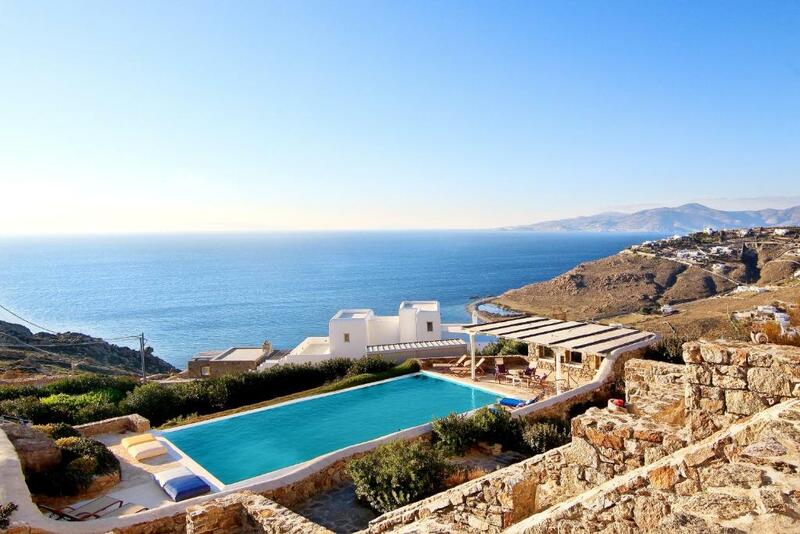 Villa Amarillo’s exterior setting, features a shared swimming pool with its dining-area being and the Aegean sea as its backdrop. blueground is a hospitality start up aspiring to create a hotel like experience in the villas it operates. At blueground, we believe in treating our guests like we want to be treated. To deliver that experience, we work together as a team while having fun along the way. Mykonos Town & old port is approximately 7 km, while Mykonos airport is 8 km away and Mykonos new port at about 3 km. Mykonos is a popular tourist destination in the Greek islands of the Cyclades group, situated in the middle of the Aegean Sea, south of Tinos, east of Syros and north of Paros and Naxos. Well-known for its nightlife, Mykonos is famed as a cosmopolitan destination among the Greek islands and widely recognized as one of the great travel meccas and one of the busiest islands in the Aegean. 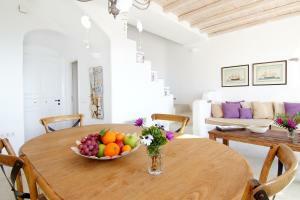 House Rules Villa Amarillo by Mykonos Pearls takes special requests – add in the next step! A security deposit of EUR 500 is required upon arrival for incidentals. This deposit is fully refundable upon check-out and subject to a damage inspection of the accommodations. Please note that the full amount of the reservation is due before arrival. The owners will send a confirmation with detailed payment information. After full payment is taken, the property's details, including the address and where to collect keys, will be emailed to you. Please note that change of bed linen and towels are provided every 3 days. Please note that check-in and key collection take place at: Drafaki, Mykonos Island 84600. A damage deposit of EUR 500 is required on arrival. That's about 562.75USD. This will be collected as a cash payment. You should be reimbursed on check-out. Your deposit will be refunded in full, in cash, subject to an inspection of the property. it’s a bit far, 15 mins from the town. The telephone connection was very slow, wifi was slow. verry nice villa, exactly like the photos. Amazing hosts, jenny was very friendly and helpful. They picked us up from the airport for free. beutiful view. It’s quiet, safe.